Fracking Opponents Feel Police Pressure In Some Drilling Hotspots Anti-fracking activists say they're being targeted by law enforcement agencies that work with the oil and gas industries to monitor threats to infrastructure. 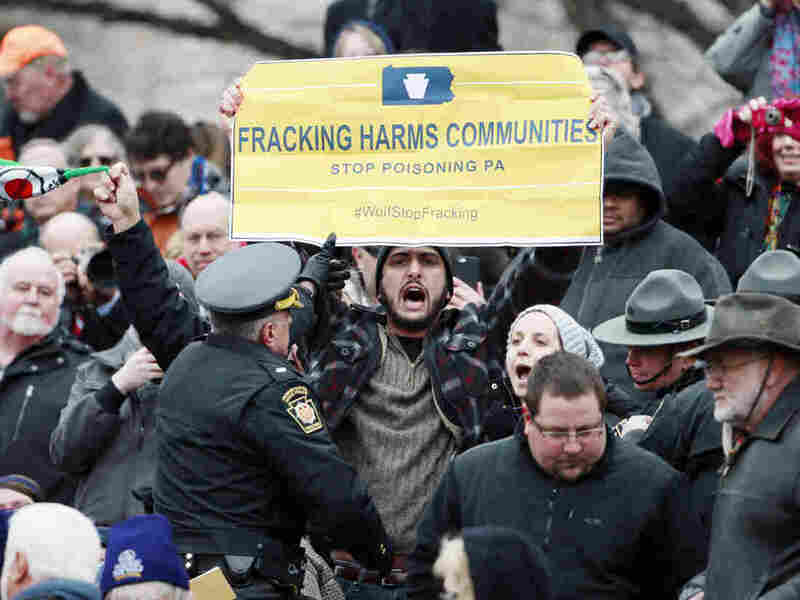 Opponents of fracking protested in January at the inauguration of Pennsylvania Gov. Tom Wolf. Wendy Lee, an anti-fracking activist and philosophy professor at Bloomsburg University of Pennsylvania, has always protested peacefully. So she was stunned last winter when a state trooper came to her home to ask her about eco-terrorism and pipe bombs. The trooper was investigating an alleged trespassing incident that involved Lee and two other activists visiting a gas compressor in Pennsylvania's Lycoming County in June 2013. Lee says they stayed on a public road and left when security guards told them to go away. Lee was never charged with anything and believes the trooper's visit was intended simply to intimidate her. "They're clearly there to send the message that they protect the industry," she says. Hydraulic fracturing, or fracking, has been controversial in the U.S. since the business began to boom. As protests have grown across the country, some police departments have begun working closely with the oil and gas industries to monitor activists. The surveillance is taking place in drilling hotspots in Pennsylvania, Texas and the Rocky Mountains. The same Pennsylvania trooper who questioned Lee also traveled to upstate New York and, along with a New York state trooper, questioned Jeremy Alderson, an activist who was with Lee at the compressor. "Having two troopers show up at your door when you can't imagine anything you've done wrong, that's kind of scary, because you don't know what's happened," says Alderson. Like Lee, Alderson was never charged with a crime. The Pennsylvania trooper, Mike Hutson, declined to comment for this story, as did the state police. (The Marcellus Shale Coalition, an industry trade group, declined to be interviewed but sent an email stating, "Safety is the industry's top priority.") But documents obtained by NPR member station WITF through an open records request show that he is part of a broader intelligence-sharing network between the oil and gas industry and federal, state and local law enforcement called the Marcellus Shale Operators' Crime Committee. Similar partnerships have sprung up in other oil and gas plays around the country, including in south and east Texas and the Rocky Mountains. Some of the biggest drilling companies in the U.S. work closely with FBI task forces to monitor potential threats. Jim Beiver, a retired Pennsylvania State Police trooper, emphasizes that the priority for the police "is protecting people." Although he never worked on energy issues or eco-terrorism, he spent much of his time as an investigator. There have been reports of pipe bombs, charred debris and gunshots fired at gas sites in Pennsylvania, but the incidents have not been publicly linked to activists. Beiver says people without criminal records can still turn to violence. "We always tried to maintain the balance of gathering information, doing our job and keeping in mind the rights of the people — keeping in mind the Constitution," says Beiver. But not everyone believes that police are striking the right balance. Paul Rossi is an attorney for the Gas Drilling Awareness Coalition, an anti-fracking group in northeastern Pennsylvania that recently settled a lawsuit with the state after it was erroneously labeled a terrorist threat back in 2010. Rossi says he's disturbed to hear about the surveillance. "I'm about as flabbergasted as an attorney can be at the serial violations of First Amendment rights in this state," he says. Partnerships between industry and police are not new. In fact, the Pennsylvania State Police was formed to quell violence between mining companies and their workers more than a century ago. The state police have a proud history of protecting the public, says West Virginia State University College of Law professor Patrick McGinley. "But that history doesn't have to be whitewashed, and historically there were abuses," he says. Activists like Lee believe those abuses continue to this day. She filed an open records request with the state police to try to find out why she was questioned. Her request was denied because the documents are part of an ongoing criminal investigation. Lee still hopes to get the records and is appealing the decision. This story comes to us from StateImpact Pennsylvania, a public media reporting project covering Pennsylvania's energy economy.